POS technology has evolved beyond being a convenient way to swipe credit cards on-the-go. Mobile POS systems will not only turn your device into a cash register, they offer fully-fledged business management tools including CRM services, inventory tracking, loyalty program integration and employee management tools – all made possible thanks to the power of cloud computing. Customer convenience is key. One of the biggest advantages of accepting mobile payments is that it makes it easier for your customers to pay you. Instead of having customers pull out out their payment cards, cash, or write out a check mobile payments support contactless payments via their smartphones (Apple Pay, Samsung Pay, Google Pay etc.). We can help you grow your business by accepting credit card payments on the go. 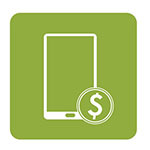 Let your business expand by processing secure payments through your smartphone or tablet. Our mobile POS systems can be up and running with minimal up front fees. Cost savings also extend across the lifetime of the service. All the software upgrades are instant; trouble-shooting is taken care of by us, and your applications and data are securely backed-up and stored within the cloud.